Hurricane Relief: The latest from Rev. Richard Norman, OKUMC-DR coordinator. In the aftermath of Hurricane Harvey, the Oklahoma United Methodist Disaster Response Ministry (OKUMC-DR) wants to keep you updated on what is requested of us so that we provide the most effective assistance. I know you are wondering: What can I do? What can my church do? What is our Conference doing? Thus this update from me as the OKUMC-DR coordinator. Be assured that trained personnel who are part of official aid processes are addressing needs as best they can in very difficult circumstances. The State of Texas is asking unofficial volunteers to not self-deploy. Showing up unexpectedly in any of the communities impacted by this weather disaster will create an additional burden. The National VOAD also has made note that environmental hazards exist, and uninvited volunteers may find themselves turned away by law enforcement. To ensure volunteer safety, as well as the safety of disaster survivors, volunteers should go only into affected areas when they receive a specific volunteer assignment, have proper safety gear, and carry valid identification. Potential volunteers are being asked to register with a voluntary or charitable organization of their choice.The National and Texas VOAD websites have links for people who wish to register to volunteer with community- and faith-based organizations working in the field. Most importantly, please be patient. Although the need is great and our desire to help strong, it also is important to avoid donating material goods until communities are safe and public officials and disaster relief organizations have assessed damage and identified what the specific needs are. 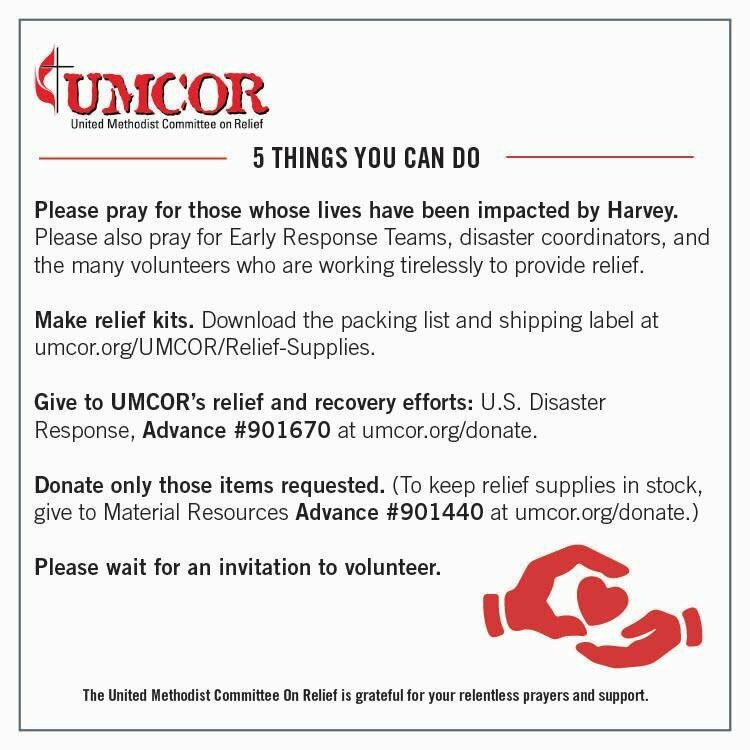 Many of you are participating in our UMCOR kit collection drive and donating financially to the Hurricane Harvey relief efforts. We thank you! Please go to our website for ongoing news — www.OKUMC-DR.org — or contact us at the United Methodist Ministry Center in Oklahoma City if you have other questions.